Gallagher, R., … (14 coauthors), Brennan, I.G., … (39 more coauthors). (submitted). accelerate trait-based science across the Tree of Life. Lemmon, E.M., Yant, L., Van de Peer, Y., Keogh, J.S., Donnellan, S.C. (submitted). and niche shifts in Australian burrowing frogs Neobatrachus. E.M., Zaher, H., Grazziotin, F., Keogh, J.S. (submitted). Total evidence dating of Australian macropods. Macroevolution across a changing Australian landscape. PhD Thesis. (2018). Esquerré, D., Brennan, I.G., Catullo, R.A., Torres-Pérez, F., Keogh, J.S. How mountains shape biodiversity: the role of the Andes in biogeography, diversification and reproductive biology in South America’s most species rich lizard radiation (Squamata: Liolaemidae). Evolution. evo.13657. Link or Download. (2018). Brennan, I.G., Keogh, J.S. Miocene biome turnover constrained body size evolution across multiple radiations of Australian vertebrates. Proceedings of the Royal Society B: Biological Sciences 285: 20181474. Link or Download. Peterson, G., Rabosky, D.L., Schwarzkopf, L., Scott, I.A.W., Shea, G., Keogh, J.S. 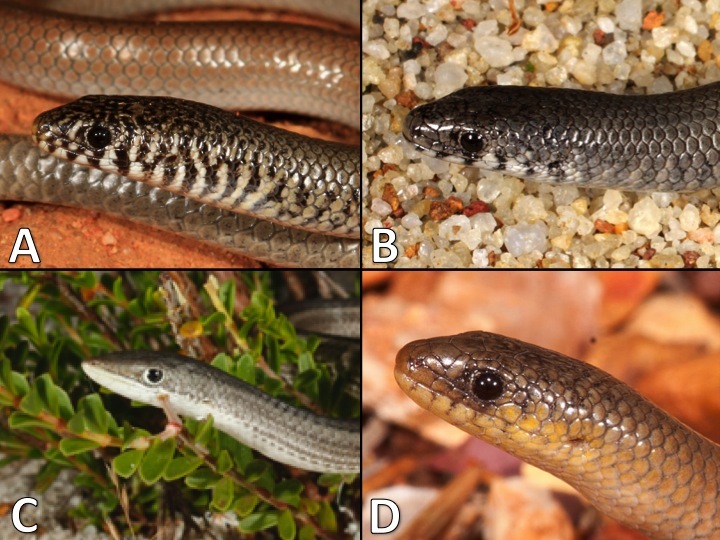 Australian Eulamprus water skinks and the biogeography of Eastern Australia. Journal of Biogeography 2018;45:2040-2052. Link or Download. 2017. Brennan, I.G., Oliver, P.M.
Mass turnover and recovery dynamics of a diverse Australian continental radiation. Evolution 71 (5):1352-1365. Link or Download. Covered in popular media at: IFL Science, the Daily Mail, Gizmodo (bonus points for "lizard-pocalypse"), International Business Times, and here at ANU (with video). 2017. Brennan, I.G., Bauer, A.M., Van Tri, N., Wang, Yy., Wang, Wz., Zhang, YP., Murphy, R.W. Barcoding utility in a mega-diverse, cross-continental genus: keeping pace with Cyrtodactylus geckos. Link (open access) or Download. 2017. Brennan, I.G., Bauer, A.M.
Notes on hemipenial morphology and its implications in the Pygopodidae (Boulenger, 1884). Bonn zoological Bulletin 66 (1): 15-28. Link or Download. 2016. Ziegler, T., Botov, A., Nguyen, T.T., Bauer, A.M., Brennan, I.G., Ngo, H.T., Nguyen, T.Q. First molecular verification of Dixonius vietnamensis Das, 2004 (Squamata: Gekkonidae) with the description of a new species from Vinh Cuu Nature Reserve, Dong Nai Province, Vietnam. Zootaxa 4136 (3):553-566. Link or Download. 2016. Brennan, I.G., Bauer, A.M., Jackman, T.R. Mitochondrial introgression via ancient hybridization, and systematics of the Australian endemic pygopodid gecko genus Delma. Molecular Phylogenetics and Evolution 94 (2016): 577-590. Link or Download. 2015. Botov, A., Trung, P.M., Truong, Q.N., Brennan, I.G., Bauer, A.M., Ziegler, T.
A new species of Dixonius (Squamata: Gekkonidae) from Phu Quy Island, Vietnam. Zootaxa 4040 (1):048-058. Link or Download. Covered in popular media at: Monga Bay. 2015. Maryan, B., Brennan, I.G., Adams, M., Aplin, K.P. Molecular and morphological assessment of Delma australis (Squamata: Pygopodidae) with description of a new species from the biodiversity 'hotspot' of southwestern Western Australia. Zootaxa 3946 (3): 301-330. Link or Download. 2015. Jono, T., Bauer, A.M., Brennan, I.G., Mori, A. A new species of Blaesodactylus (Squamata: Gekkonidae) from Tsingy karstic outcrops in Ankarana National Park, northern Madagascar. Zootaxa 3980 (3): 406-416. Link or Download. Natural History Notes. Osteophagy by Agassiz’s Desert Tortoise Gopherus agassizii. Herpetological Review 43 (4):638–639. Download. Interspecific and intraspecific relationships and biogeography of flap-footed geckos Delma Gray 1831. Unpublished M.Sc. Thesis, Villanova University, Villanova, Pennsylvania, USA, 143 pp. Download.